Forest Hills is thick with restaurants, especially on its upscale Austin Street. Though it lacks a spectacular ethnic restaurant -- at least on Austin Street, the overall quality and range of restaurants in middle class Forest Hills (and wealthy Forest Hills Gardens) is among the best in Queens, New York. There's good Japanese, Thai, Chinese, Argentine, Uzbek, and Italian, plus Irish pubs and a Japanese market. Along with quality, though, comes price. Dinner in Forest Hills isn't cheap. Disagree? Couldn't agree more? Share your opinion on Forest Hills restaurants. For dim sum, top choice is Golden Pond Seafood (113-15 Queens Blvd). It gets crowded on weekends. Expensive Bann Thai (69-12 Austin St, 718-544-9999) won praise in the first ever Michelin Guide to New York City. Bangkok Cuisine (107-18 70th Rd, 718-261-4005) has a great location and neat design with so-so food. Q, A Thai Bistro (108-25 Ascan Ave, 718-261-6599) is fancy and pricey, but sloppy and not very spicy. Just Like Mother's (110-60 Queens Blvd, 718-544-3294) is a delightful Polish-American restaurant, and a great brunch option. Spacious and light, with friendly service. It also ranked as a Best Breakfast in Queens from About.com. Off near Kew Gardens, Hot Bialys (116-63 Queens Blvd, 718-544-0900) bakes the best bagels in Forest Hills, maybe the borough. Plus you can get a Thai iced tea at the same counter. 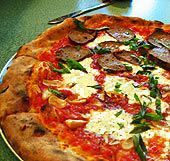 Nick's Pizza makes the most delicious thin-crust pies to be had in the borough. The vinyl booths and great service add to the allure. Hole-in-the-wall Pahal Zan (106-12 71st Ave, 718-793-7177) serves amazing Israeli falafel and kebabs. They're underneath the LIRR tracks, so get yours to go and sit up atop the LIRR station to survey the whole Forest Hills scene. Get the full falafel platter that comes loaded with Middle Eastern salads. The Moroccan carrots are a delight. North of Queens Boulevard, on 108th Street, there's a whole other side of Forest Hills, one that's much more an immigrant community than middle-class neighborhood. The delis and restaurants will tempt you with Russian and Central Asian tastes. mainly Bukharian. Top-pick Salut (63-42 108th St, 718-275-6860) serves kosher Burkharian Uzbek kebabs, garlicky fries, and thick bread, while Mexican soaps dubbed into Russian play on the overhead TV. Small Salut is far from the subway, but it's a lot easier than hitching to Samarkand. In Rego Park, Cheburechnaya (92-09 63rd Dr, Rego Park, 718-897-9080) also gets praise. Why doesn't Forest Hills have a great bar? The hands-down local favorite is Mexican restaurant Five Burros (72-05 Austin St, 718-544-2984). Start drinking early if you want a seat at the bar. Dirty Pierre's (13 Station Sq, 718-830-9698) serves good burgers in a cluttered pub by the Forest Hills LIRR station. Is the dirt in name only? It's best for a bottled beer in a relaxed setting. Irish Cottage Restaurant & Pub (108-07 72nd Ave, 718-520-8530) is all about the Guinness and comfort food like shepherd's pie, and the drunk regulars at the bar. Bartini's (1 Station Sq, 718-896-5445) is good for the appletini set. Munch Cafe & Grill (71-60 Yellowstone Blvd, 718-544-0075) is a tiny place for coffee and tea--and even yummy waffles. It's good for kicking it, but not for eating meals if you're in a hurry. Of course Starbucks (107-12 Continental Ave) is in the thick of things, on 71st Avenue (a.k.a. Continental Avenue) at Austin Street. Martha's Country Bakery ( 70-30 Austin St, 718-544-0088) opened its Forest Hills branch in 2007, and though its cupcakes are yummy, service can get overwhelmed. Chinese bakery chain Fay Da Bakery (107-50 Queens Blvd, 718-268-8882) is fun for a novel, fruity birthday cake. Eddie's Sweet Shop (105-29 Metropolitan Ave) is off the beaten track, but more than worth the walk for thick, creamy homemade ice cream, real hand-whipped cream, and old-school sundaes. Combine your pilgrimage with a visit to the next-door movie theater on a summer night. When Forest Hills' own Ray Romano visits his home turf, Tutto Bene is his pick. It's cute and the food tastes good, but the reason for the slow service? Our waitress said the chef/owner insists on cooking everything himself from start to finish. Get it? This crowded Mexican restaurant has a long wait and lively bar scene. A little Japanese grocery and DVD/video store, Oishii's usually has handmade gyoza to cook at home. In 2010, after 4 years of comments about eating in Forest Hills, I decided a lot of the old comments were out of date, and less than useful for you eaters. New opinions are welcome here. If you're interested, you can still access the old ones. Forest Hills 72 sometimes posts about local restaurants and markets. Forum Queens Central is another good place to dig for local eating options. Any other suggestions for local foodie blogs?